This isn’t how I planned it, but then, does anything in homeschooling go according to plan? I would have liked to have begun a math program in Kindergarten and stuck with it, at least through the sixth grade. That would have helped me be able to avoid repetition, progress more efficiently, and be able to keep a more accurate assessment of exactly what she was mastering. My oldest daughter struggles with math; the logical, detailed nature of things like arithmetic are just a challenge for her creative, spatially-oriented, holistic right-brained mind. To help her, I have used a variety of programs – actually 3 different programs in 4 years. I’ve tried a number of different approaches, with mixed success. The good news is that she is progressing adequately, and I have learned a lot about homeschooling math programs. The bad news is that it is highly likely that no matter what program I use, math is just not ever going to be “her thing”. Except, is that really bad news? Sometimes it feels like it. Because as homeschool moms we pressure ourselves to believe that our children must be the equivalent of straight A students in every subject, to validate the fact that we are doing a good job and our children are getting a good education. We stress over test scores and whether they are progressing quickly enough through their books, and we do everything possible to maximize our children’s learning. We change programs in search of the “holy grail” of a fit that will just skyrocket our kids to academic stardom. But the truth is that when our children struggle in a certain area, it doesn’t have to be “bad news”. It can simply be a journey to learning more about our precious children, and a pathway to helping us appreciate and nurture their unique and individual needs. Isn’t that why we homeschool to being with? Certainly, if there is a program out there that will be more conducive to my daughter’s success in math, I definitely want to find it. I actually have switched to my newest program, because as I’ve learned more about her and her learning style this past year, I’ve been able to refine the parameters of what I believe will help her learn best. Our past curriculum wasn’t bad (actually, it was quite good); but I think the new one will be even more effective. Regardless of what program I use, though, the truth is that math is not ever going to be her strong suit. And, I’ve learned, that’s okay. Because she has so many other strengths. And the strengths that “traditional school” nurtures and applauds are not the only strengths that exist. I homeschool to nurture the child that I have, not a cookie-cutter child that fits into the mold the government believes she should fit into. And the child I have has strengths in areas that are going to serve her very well after this whole schooling thing is over – creativity, social and emotional awareness, technological savvy, communication skills, and a mechanically-oriented mind, just to name a few. I also know that she would not, if she were in public school, get much focus on developing those strengths, but that because we homeschool, we get to individualize our approach to nurture her unique skills. And that is much more important to me than making sure she is a math whiz. So…we’re beginning a new math program. 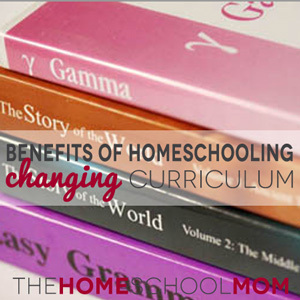 Yes, we are changing homeschool curriculum—again. But not because I have delusions that this one will be the magical answer that will transport her into the world of math genius. We begin a new book because I believe doing so will be the most individualized way to help her learn math best, according to her own unique abilities. And rather than letting her academic challenges make me question my own effectiveness as a teacher, or the efficacy of our decision to homeschool, I am going to let them move me to appreciate the opportunity homeschooling affords to individualize my teaching to the wonderful child that I have. Some may see 3 programs in 4 years as bad news. I see it as the blessing of being able to fit the curriculum to my child, instead of trying to fit my child into the curriculum. And I see it as yet another opportunity to seek out and develop the special strengths that are unique to only her – and to appreciate the homeschooling that allows me to know and nurture them. Thanks for sharing your thoughts. I have a daughter who is a reluctant writer, just doesn’t see the process. I agree: it is okay. We have been exposed to several math programs. When in virtual school we have used: K12 k-2 and 4th, Little Lincoln 4k-k, and Calvert 3rd. We went traditional this year and with my 5th grader we started Life of Fred and went from the beginning book to mid intermediate level and plan to get into fractions and decimals next year. This was a good fit for my reluctant reader as it interested him enough to want to read it on his own eventually. I plan on using this for my other two as they get older. With my 1st grader this year I used a complete curriculum workbook (sams club) k12 K workbook, and a time, money workbook that I picked up on amazon to give her a broad base before we start Fred. I have used BJUP Math, which I think is excellent for the first-time homeschool mom who wants a colorful, solid Math program for young children and needs a script to know how to teach, I’ve used Math-U-See, which is great for hands-on learners and those that learn best from a mastery approach, and now we’re on to Math Mammoth (which seems to meet my daughter’s needs the best, so far!). All of the programs were good. The issue wasn’t “Which one is the best?” but “Which one is the best for my particular child?” I would recommend all three of these programs to parents…you just have to try and see what seems to be most effective for each child you have! Curious which other ones you tried. We have tried three different ones also! But like you said – at least we homeschool so we have the opportunity to switch things up. Math is important so we have to find something that works. I applaud you for your diligence and committment! My son is 5 years and 7 months old, lol and I use the CLASS curriculum (k-2) from Christian Liberty Academy and so far my son enjoys it, however, we use a flex-time schedule due to his age and attention span. This schedule, surprisingly, helped me and our son work with his learning intelligences which are similar to your daughter! I was am amazed! Satellite curriculums and programs are not typically geared that way….thanks for sharing! I chose Math Mammoth, and have been very pleased with it! I think this one’s a keeper! We’re in the same boat! My eldest daughter has used two math curriculums and isn’t happy. It’s not her strongest subject, and so I try to be flexible. We’re using Teaching Textbooks; I love it, she’s not thrilled with it – in her 2nd year of using it. Maybe back to Horizons next year? Would love to hear your input on the curriculums you’ve used!